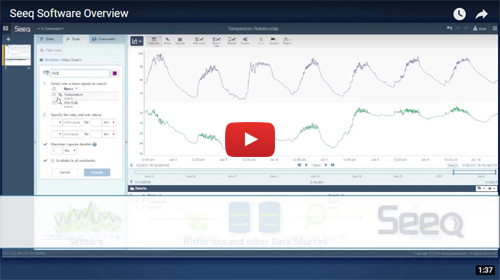 time series data like never before. Seeq is intuitive, visual and innovative. GE Proficy or any other – Seeq can connect and get you working in minutes. Yes, in minutes. Seeq is not just a new way to work, it's a new approach to software for the process manufacturing industries. In the current hype around predictive analytics, machine learning, and data science, the key that is missing is you. You, the engineer or analyst, that actually knows something about the assets and operations involved in process manufacturing. You, with the expertise and experience to know what matters and where to look to find answers. All you need is an application that accelerates your efforts to find the insights that everyone else can only promise. That's what Seeq is: your brain, our brawn. Let Seeq do the heavy lifting to enable you to more rapidly discover insights in industrial process data.